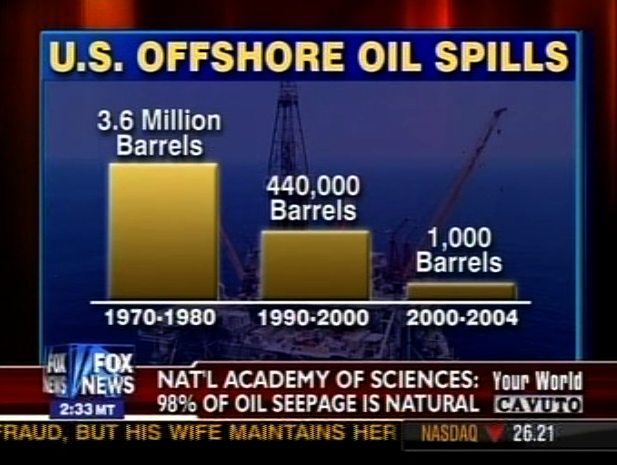 News Hounds: Fox: Offshore Drilling "Could HELP the Environment"
Fox: Offshore Drilling "Could HELP the Environment"
To LaJeunesse who said that "most opposition to offshore drilling, of course, is based on fear. Fear of an oil spill" and "when oil washes up on the beach here in Santa Barbara, people naturally blame big oil." But "the National Academy of Science" says "Mother Nature spills more oil into the environment than Exxon, Shell and BP combined." Then to two unidentified (that in and of itself makes me so suspicious; what are they hiding?) supposed "experts," one of whom said that in the Santa Barbara channel, "there might be 200 barrels a day seeping through the entire region," and another who said that shipping, drilling, the pipelines, etc., "all basically lead to the release of greenhouse gasses." "Now, we are dumping more oil out of jet airplanes as they jettison the fuel in emergency landings than come off of offshore platforms." Comment: So, how does this "help the environment?" 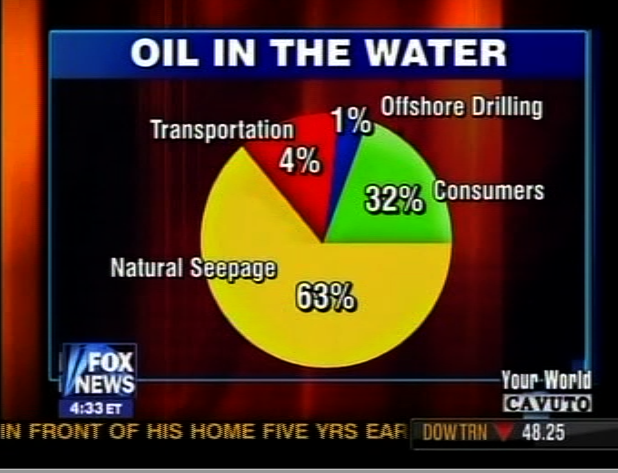 Guess we're supposed to believe that we'd better get that oil out of there so it stops seeping, huh? Judging from a perusal of the Internets, it seems that all of a sudden â I found several very recent newspaper articles citing it â someone picked out and released info contained in this report released by the National Academy Press in 2003. Hum, wonder who that was. Don't suppose it was none other than Exxon or Shell now do ya?! Whoever took the time (and has the time) to dig this far back is, I'm sure, eternally grateful to Fox for doing their propagandizing for them.